Product Consists : Artificial Red Rose in a small jar with Jute Wrapping and Couple Teddy Bear (Approx Size : 4 Inches) along with Love Greeting Card. Love is best way expressed through a romantic gift. 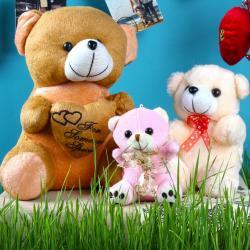 Show your beloved that you two are made for each other with two loveable teddies. These cute little fellows sit happily. Make your sweet hear child and feel special as you present her huggable soft teddies, if you are away then these love teddies cheer your love one. The gift includes the love greeting card including love romantic message on it. Rose is called as king of flower and symbol of Love; here we presenting an artificial red rose to representing your everlasting love. 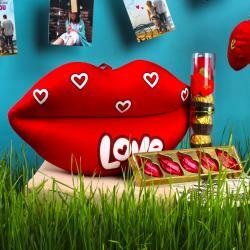 So, go ahead and buy this gift and delight your love one in India. Product Includes: Artificial Red Rose in a small jar with Jute Wrapping and Couple Teddy Bear (Approx Size: 4 Inches) along with Love Greeting Card.